I absolutely loved this hotel! It was a short walk from the hustle and bustle of the main square, but the view from the hotel makes it all worth it. We had a comfort lake view room which had its own terrace, absolutely stunning! The staff is very friendly and helpful with any questions or help you made need. The breakfast, which is included, was great. They even have made to order hot items. I would definitely stay there again, oh and the shower! The shower had about 6 different water jets, perfect to relax after a long day of walking. The hotel itself is a great building and the staff that we spoke with were all excellent. The room was a very good size, we had a proper 6ft width bed that was comfortable and I would rate the hotel as one of the best that we have stayed in. We visited the Spa for about 2 hours during our stay, and found it to be beautifully presented and a fun place to explore and chill out in. We were the only people there and so had the entire Spa to ourselves which somehow felt very decadent and somewhat special. If you like Spa's ... you will definately like this hotel. We never did eat at the hotels main restaurant. The menu was somewhat limited for us vegetarians (which is the only criticism I might have), and the one night we we did eat at the Hotel, we ate from the room service menu, which was good. Moltrasio itself was some how disappointing. The location and the lake itself are every bit as spectacular as you might expect, however Moltrasio is a medium sized residential area with several hotels and ... not much else. We went quite early in the season and there may well be much more going on when the season gets going, but we found ourselves very pleased to have hired a car, which I recommend. It allowed us to drive to other towns so that we could spend the evenings having dinner outside enjoying the spectacular location that the lake provides. The Hotel does have a second lake side restaurant, however, it had the same limited vegetarian menu so we did not visit it. Where to find Morcote hotels near an airport? 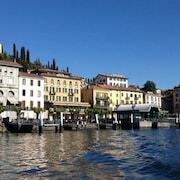 Where can I find hotels in Morcote that are near tourist attractions? Visitors can find a generous assortment of hotel options to select from in Morcote. For those wanting to stay within 0.1 kilometres (0.06 miles) of the heart of Morcote, Expedia's up-to-date database lists at least 61 hotels and apartments in that area. Stay close to the center of Morcote. Hotels here include Swiss Diamond Hotel and Hotel Zappa. The CastaDiva Resort & Spa is located 18 kilometres (11 miles) from the heart of Morcote. Or, alternatively, the Hotel Eden Roc is situated 25 kilometres (16 miles) away. 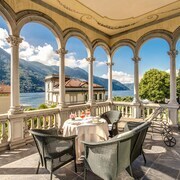 The Villa Orselina and the Giardino Ascona are some other accommodation options worth looking into around Morcote. 10 kilometres (6 miles) to the northeast of Morcote you will find Lugano, where you can spend the day visiting Museum of Modern Art and Santa Maria degli Angeli. 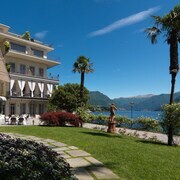 If you'd like to spend a few nights in Lugano, check out the room rates at the Grand Hotel Villa Castagnola and Hotel Splendide Royal. 5 kilometres (3 miles) to the northeast of Morcote, you'll find Lake Lugano, which is home to the Villa Principe Leopoldo and Suitenhotel Parco Paradiso. If you're staying in Lake Lugano, make sure you visit the Hermann Hesse Foundation and Museum and Lugano Exhibition Centre. Before you leave Ticino, make sure you catch some local sport. Visit Pista La Resega to the north of Morcote. For travelers who are keen on booking a bed nearby, make a reservation in the Grand Hotel Eden or Villa Sassa Hotel, Residence & Spa. Agno Airport is a logical airport, and is located 8 kilometres (5 miles) from Morcote. 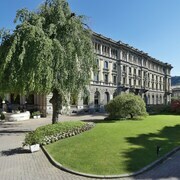 Expedia-listed hotels close to Agno Airport are Kurhaus Cademario Hotel & Spa and Best Western Hotel Bellevue au Lac. 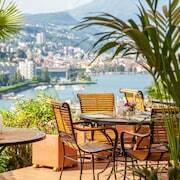 What are the most popular Morcote hotels? 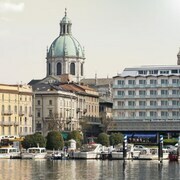 Are there hotels in other cities near Morcote? What other types of accommodations are available in Morcote? Explore Morcote with Expedia.ca’s Travel Guides to find the best flights, cars, holiday packages and more!